FROM EXECUTIVE BOARDROOMS THROUGH TO INDIVIDUAL OFFICES – WE CAN HELP TAILOR THE MOST EFFECTIVE FURNITURE SOLUTIONS FOR YOUR BUSINESS. FOR A LOOK THAT’S MODERN, TRADITIONAL OR SOMEWHERE IN BETWEEN. We work with the leading furniture manufacturers in the business and provide a seamless, one-stop supply and installation service. 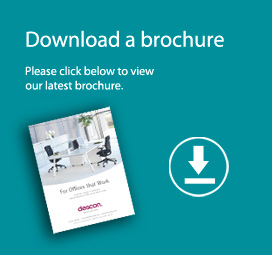 Whatever your requirement – from a comprehensive, multi-functional office fit out for hundreds of members of staff, through to the supply of single items of furniture – Descon will always ensure you make the most of your space. So that you have an office that works for you.